Monthly demonstrations are the first Monday of each month from 10:00-12:00 pm. ​Open to anyone wanting to learn and practice different arts. Cost is $5.00 and includes a pot luck lunch after the demo. Hands on Stamping. BRING YOUR SCISSORS! Can you just not find the perfect Christmas or Seasons Greeting card for some special people on your list? Come and make your own as you explore the art of stamping. A variety of materials will be supplied - paper, rubber stamps and ink pads, colored pencils, craft scissors and punches, etc., along with a few ideas for anyone needing a little boost on creativity. Bring your own ideas and your imagination! Please also bring your own scissors. Endless possibilities of cards can be made, along with gift tags, place cards, etc. 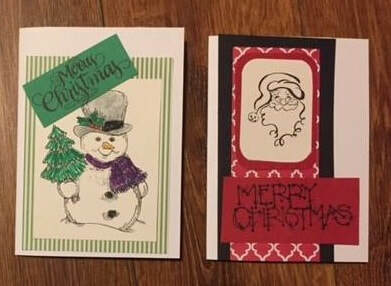 No talent is needed - just come, have fun, make a card or two (or more! ), and be introduced to a new and relaxing craft! Susan Cathey moved to Llano from Abilene in 2012 after retiring from 30 years of teaching elementary grades and special education. She's attended several stamping and scrapbook classes and had accumulated over 100 stamps including a variety of holiday stamps which she's anxious to share with folks in the Hill Country. She'd love to start a group of stampers / card makers. Laura Corzine’s Demonstration will be making art from computer parts. 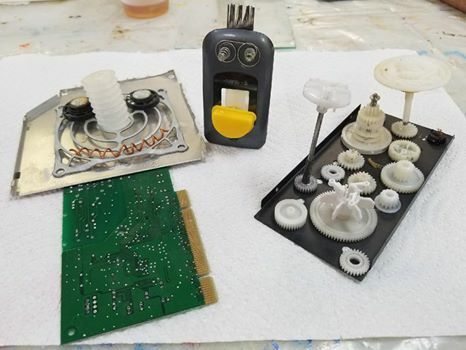 Jump-start your creative juices to come up with fun ideas for making your own original art using computer parts. 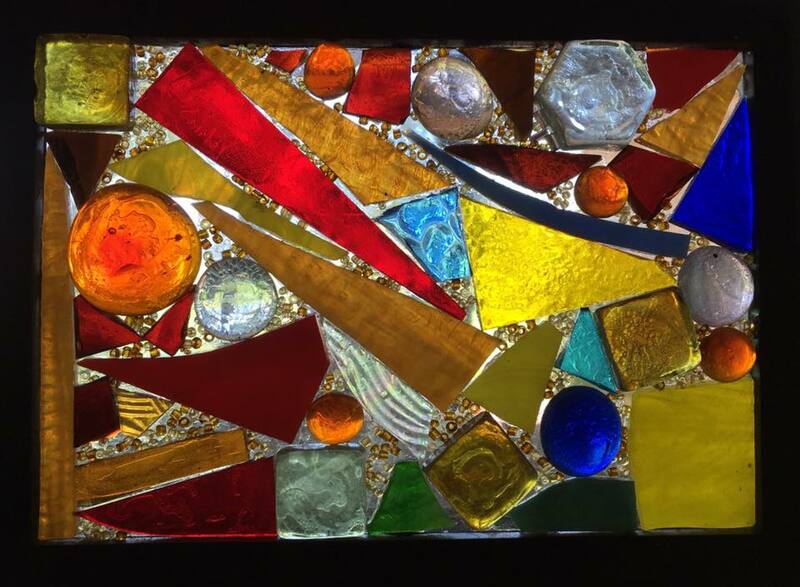 Sylvia Ewing assisted by Sheri Zoch will present a hands-on “glass on glass with no grout” demonstration. Picture frames with glass will be provided along with transparent to semi transparent glass pieces. Everyone is invited to bring family glass or special glass pieces; a glasscutter will be available. Magic is about to happen when you come and have fun making your own glass design. If you have a piece you made in the last glass on glass class you are encouraged to bring it to share. 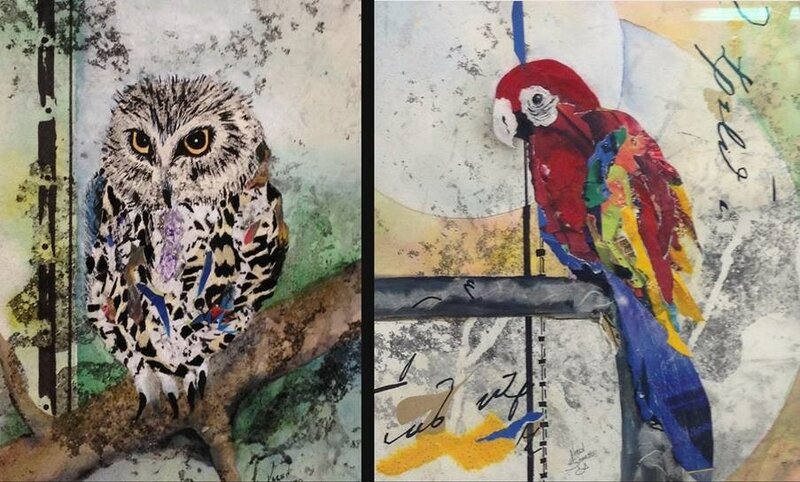 Sylvia Ewing and Sheri Zoch are both members of Llano Fine Art Guild & Gallery. They work in glass, paint and do a variety of different art forms. Sheri owns the Glass Menagerie in Llano. Pastel Hands-On Demo Douglas Garey. IF YOU HAVE PASTELS, PLEASE BRING THEM. 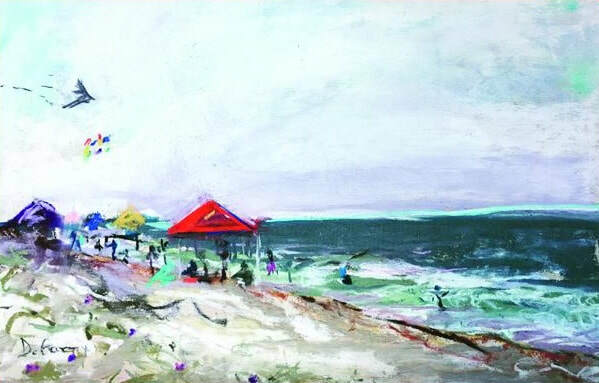 Acrylic painting demo will be presented by Tom Orsak from Harriett, Texas. Tom was born in Texas and lives in the farming community of Harriett just east of San Angelo. He enjoys painting the beauty and heritage of West Texas. Tom began painting in 2001 after a distinguished career in outdoor advertising. He has studied and worked with many renowned artists in this quest to find his own style. His hard work and dedication to painting has been recognized and rewarded in art shows regional and national. ​​Karen is a multi-media artist delving into abstract and impressionistic genres. Karen’s demo will involve doing a graphite pour on watercolor paper, then using watercolor and torn paper to create multi-media art. Karen works with glass in her glass kiln during the summer months. Karen was co-owner of The Blank Canvas Gallery she has exhibited in Art Leap in Park Rapids, Minnesota and last April she did a month long show in the Arnold Art Gallery in Mason, Texas. There are a number of subjects that are suited for collage: landscape, flowers, buildings, animals, etc. All may be done in a realistic or abstract style. Jean will bring some ideas & studies of some of her work. Supplies to make your own collage will be furnished. You may bring your own photos or magazine prints to use. Jean moved to Ballinger in 1995 when her husband Charlie retired from the U.S. Border Patrol. She has been painting & teaching painting for 30 years. Jean is the president of the Mid-West Texas Artist's Guild, Ballinger and a member of The Creative Arts Club in Abilene, Texas. Her weekly painting class is at the Do-Art Studio. Sue Kaan will be giving a hands-on painting demo. Join guild artists for a Mixed-Media Valentine Card demonstration led by Jane Lynch, Bea Wimberley and Sylvia Ewing. They will guide you through the process to create a unique work of Valentine art using various mediums. Paint and assorted collage materials will be provided to produce these fun works of art. Take home your creation or donate it to go to residents at local assisted living centers. 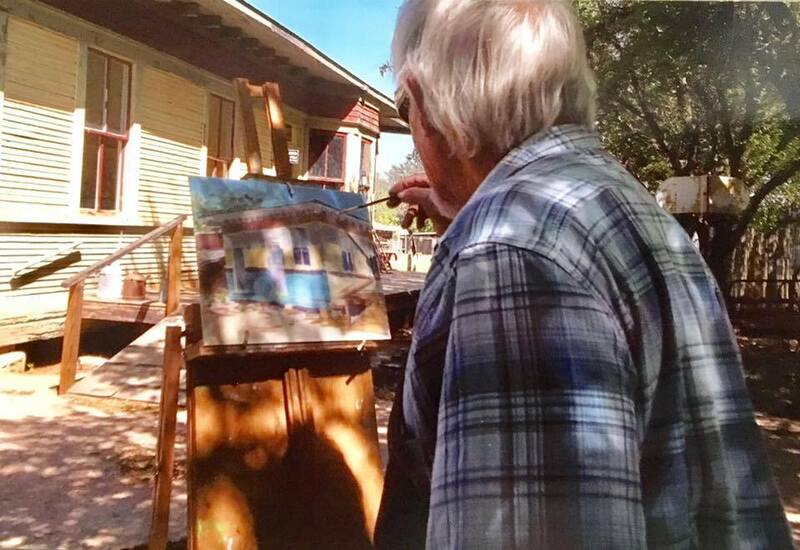 ​Barry Selman of Granbury, Texas will give a hands-on watercolor demo. Barry Selman started painting almost 40 years ago.Typically, an artist gravitates to one or more mediums: oil, acrylic, sculpture, collage, drawing, watercolor, glass, pottery, and the list goes on. Selman's choice is and has been watercolor from the beginning. In January of 2016 Selman retired from the oil fields and really started to concentrate on his art. Retirement gave him an opportunity to take classes from the top three water colorists in the US: Mel Slabin,Tony Van Hasslet, and Tony Couch. He is excited to share the tips and techniques he has learned along the way. Selman says, "Most of my painting ideas come from glimpses of an old building, a barn falling down, or a windmill turning with just a gentle breath of air. Most people pass by these scenes and never really look, but when I look, I see amazing shapes, beautiful colors, and wonderful textures; at that moment, a painting is born. One thing I have learned is that you do not have to travel to the far corners of the globe to find beauty and inspiration. You will discover scenes worthy of painting anywhere you go, very often not far from home." Barry Selman believes that even if one doesn't choose to become a professional artist, creating art can play a significant and rewarding role throughout life.